My best friend Patty Bowman has written her first children's book. It's called "The Amazing Hamweenie" Go check it out! Buy it for every child in your life. Dressed in his signature top hat and black cape, Hamweenie is poised to earn his place among the most famous celebrities and daredevils of all time. From the stage to the red carpet, the skies to the sea, Hamweenie believes, without a doubt, that he will be the greatest star the world has ever seen. The horrors of reality, alas, befall him: a beautiful apartment, a loving little girl, his every need fulfilled to excess. His treats are simply too delicious. His pillows? Beyond luxurious. Such torture! Hamweenie must escape! But with his wretchedly wonderful owner appearing at every turn, will he ever make it out of the apartment? 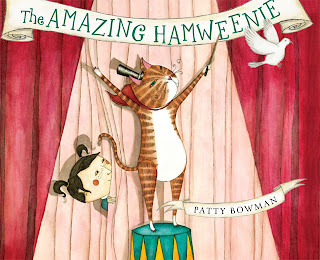 From debut author and illustrator Patty Bowman comes a picture book about the secret life of cats and about dreaming big--no matter what your species." CLICK HERE OR ORDER A COPY!